Some people follow the gluten free diet and begin to feel better. Then they begin to experience a renewal of symptoms. They may check for additional allergens, but find no trigger for their symptoms. They may keep a food journal, and still get no answers. Then, by chance, they notice that they feel better on days where they avoid all grains. Not just flour, but rice, corn, oats, quinoa, buckwheat, and other grains that are common substitutes on a gluten free diet. Once they realize that they have trouble with these other grains, as well as the usual gluten grains, they search for recipes that are grain free. 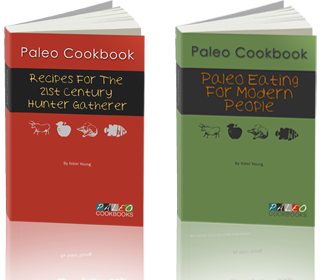 The Paleo Diet is based on what you would expect the early humans that were hunter gatherers to have eaten. The principle is that this is what humans evolved to eat. It works for those with this difficulty relating to any form of grain. Many feel better once taking this approach. The hardest part of following this diet is that recipes that use only these grain free items are hard to find. If you simply rotate the same meals over and over it can be boring and leave you feeling discouraged. Between the two cookbooks you would receive 200 recipes, plenty of variety for an entire year! If you feel that trying the diet might help you improve your health beyond what you've achieved by going gluten free, then I hope you will take the time to look these cookbooks over. Nikki Young offers a 100% satisfaction guarantee for 3 months. You can't lose by trying the cookbooks. If you don't find them satisfactory, you can get a refund. This is a generous guarantee by any standards. The pictures of some of the meals in the cookbooks look very tasty too. There is no shipping charge, because these are e-books that will be downloaded to your computer. Please note that your purchase of this item may generate a small commission that helps to support this site, without any additional cost to you. So take a look and see if this can help you with meals for the Paleo Diet, or even just as something to add to your gluten free diet recipes.